If you are flying or driving in on Friday, make your reservation forFriday night at the the Holiday Inn/Ameristar (limited number of rooms) If you are with our charter we have made arrangements for you to leave your car there all week. We'll send you information as we get closer to RAGBRAI week. The afternoon and evening is yours to visit the town, but be sure to stop by our registration table to get your registration packet and t-shirt. We'll also take your picture and put it on the "Wall of Fame" board in the truck. It's a RAGBRAI traddition to dip your rear tire in the Missourri and your front tire in the Mississippi, so follow the signs to river and don't forget to get a picture each time. Around 4:00 we gather for a Meet and Greet (usually wine, fruit, cheese and crackers), where we will introduce the staff, explain the routine for the week and give pointers on how to make your week that much more enjoyable. RAGBRAI usually brings in a well known band the first night for everyone to enjoy. We start early so our crew can tear down and get set up at the next town and be ready when you arrive. We start with free coffee around 6:00 AM. Every morning you will load your luggage and personal tent onto our truck for transporation to the next town (truck leaves at 7:30 AM sharp). We'll have water and tire pumps for those last minute fill ups before you head out. Get on your bike and ride the designated route. Enjoy the wonders of Iowa and the eintertainment/food/beverages as you pass through the many towns on your way to the next overnight town. While you are gone the truck drivers will get camp set up, rental tents ready, awnings up, shower tents ready (where permitted), beverages iced and snacks replenished. We try to set up at spots with all the amenities (we start searching in May), shade sometimes, close portapotties (they call them kybos) sometimes. We do our best. As you come into each overnight town we will have dozens of signs up directing you to our campsite. 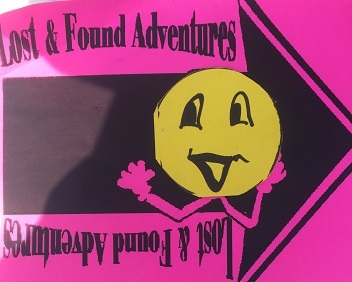 Look for our bright pink signs with the yellow Happy Face on the street poles along the way in. If you get lost, no worries, locate the RAGBRAI information board. We will have the location of our campsite on the information board. When permitted by the overnight towns, we will have solar showers set up within our campsite (no extra charge). If the overnight towns will not allow the solar showers, we will try to camp near shower facilities (i.e. community centers, high schools or shower trucks). Recommend you put your name on the shower wait list as soon as you get to camp, usually your name will be called about the time it takes you to set up your tent (but can vary depending on the number of riders coming to camp at the same time). We will have laundry soap, washing containers and a clothes line available (at no charge) if you want to hand wash and dry your clothes. We'll have our charging station set up, best to get your phone and other electronics on it right away, the generator (if no local electricity) will be shut off at 9:00 PM. Canopies and a couple dozen folding chairs are available for shade and relaxing around the camp (Exclusive tent option comes with two chairs outside your tent). RAGBRAI provides a printed guide, with maps, with the places to eat and nightly activities. We will try to have some of these publications available within our campsite. Also look for welcome stands as you enter the town for these guides. The morning and ride routine is pretty much the same as other days. There will be fewer food vendors along the roadside, but plenty in each pass through town. Upon completing the ride, you can either dip your tires in the Mississippi or head directly to our trucks. We will have signs up for both routes. Once at the truck, check in with the staff and take your bike to the loading crew for packing. Bus leaves at 3:30 for the ride back to the Holiday Innn/Amaristar in Council Bluffs, IA. The bus stops in Des Moines for a quick bite to eat. We arrive in Council Bluffs around 9:30-10:00 PM back at the Holiday Inn/Ameristar. Charter Options 2 & 3 are the same as above except your adventure ends before bike packing and bus trip home. But please stop at the truck to check-in, get your gear and say your good-byes.